More than 100 programs, projects and studies were presented in the three-day Annual In-House Review (AIHR) of the University. The AIHR, which accommodated not only the completed studies but the on-going and proposals as well, was held at the Northern Philippines Root Crops Research and Training Center (NPRCRTC) from August 8-10, 2018. During the opening program on August 8, BSU Vice President for Research and Extension, Dr. Carlito P. Laurean shared how policy implementation has posed challenges to the R&E sector including disallowances. “We considered the challenges as a chance for us to improve the steps and procedures in the university, because of the challenge of getting appropriate honoraria being provided by our funding agency. We made some improvements and this was also recognized by our Commission on Audit,” said Dr. Laurean. “One strategy that we did is to have our faculty researchers be certified as S&T researchers under the Magna Carta of S&T personnel in the University. Presently, there are 81 faculty researchers that are DOST certified and they are now receiving their honoraria for the project that they are implementing. Even for our support services like managing the consortium was also considered as part of S&T so faculty and employees (concerned) are also starting to receive their corresponding honoraria,” he added. According to the Office of Research Services (ORS), there are 511 registered studies in the University as of June 2018. 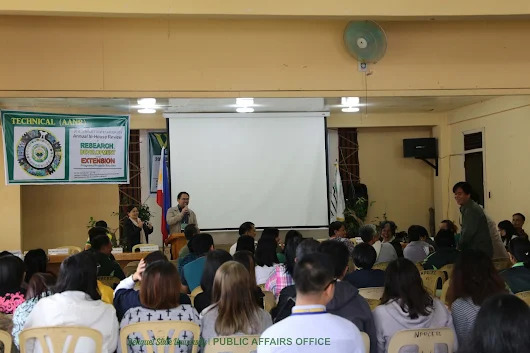 “Aside from opportunities for presentation and NBC points, faculty members and employees conduct researches despite many challenges because it’s their passion and their willingness to contribute to relevant studies especially those that concern present issues,” said Science Research Specialist Matyline C. Talastas. The conduct of the AIHR forms part of the Monitoring and Evaluation modalities for completed and/or ongoing RDE programs, projects, or studies/activities in the University. It is among mandates of the Benguet State University as RDE member institution of the Cordillera Consortium Agriculture, Aquatic and Resources Research and Development (CorCAARRD, formerly HAARRDEC). The review was divided into three categories—Technical, Social Non-AANR (Agriculture, Aquaculture and Natural Resources) and Social AANR/Extension. Evaluators were: Teresita K. Mangili (CorCAARD), Roel R. Suralta (Philippine Rice Research Institute), Lorenza G. Lirio (retired BSU professor), Miriam V. Tiongan (Benguet LGU), Rhandy S. Tubal (Watershed and Water Resources Research Center-ERDB), Dante M. Aquino (Isabela State University) and Maria Teresa L. De Guzman (DOST-PCAARRD) for the Technical Category; Virginia L. Anceno (CRHRDC), Annie Grail F. Ekid (Mountain State Polytechnic College) and Leah E. Abayo (UP Baguio-Cordillera Studies Center) for the Social AANR/Extension; and Mariano D. Marchan (CHED-CAR), Rhoda B. Galangco (University of Baguio) and Esther R. Hufana (retired BSU Professor) for the Social Non-AANR category. The closing program was held on August 10 where ISRD Director, Dr. Cheryl Launio announced that out of the papers presented, there were 26 papers qualified for oral and 19 papers for poster presentation at the CorCAARRD Regional Symposium. The winning papers for the technical category are: "Shiitake Production Technology as Component of Arabica Coffee-Based Agro-Forestry in the Cordillera (7 studies; 5 activities)" by Bernard S. Tad-awan, David Sumalang, Joel S. Acyapas, Johnwayne Tosay, Luis Calama and Marjoe S. Salavaria (1st Place); "Mapping of Spatial Distribution of Carbon Storage of the Pinus kesiya Royle ex Gordon (Benguet Pine) forest in Sagada, Mt. Province" by Nova D. Doyog, Roscinto Ian C. Lumbres and Young Jin Lee (2nd Place) and "Development of Protocols for the Production of Inoculants and Field Application of Atoxigenic Strains of Aspergillus flavus (ASAFs) as Biological Control Agents (BCAs) Against Pre-Harvest aflatoxin Contamination of Peanut" by Janet S. Luis, Benjamin T. Tabus, Alexander A. Dorate, Marijo S. Neo-neo, Marjorie P. Colas and Joan B. Pedro (3rd Place). For the Social AANR/Extension Category , the winners are: "Building Farmer's Resilience in Disaster Prone Areas in Bokod and Kabayan (5 studies) by Carlito P. Laurean, Ruth S. Batani, Belinda A. Tad-awan, Alexander W. Fagyan, Andres A. Basalong, Frits Finmorog, Michael Lloyd Lee and Alexander Baday (1st Place); "A Survey of Sweetpotato Infestation in Selected Communities in Benguet and Ifugao Provinces" by Ruth S. Batani, Rhea S. Loncio, Kacy O. Labon, Raiah S. Batani (2nd Place) and "BSU Talknology: Touching Lives of Rural Communities in the Northern Philippine Highlands" by Constantino T. Sudaypan and Julie I. Calatan (3rd Place).